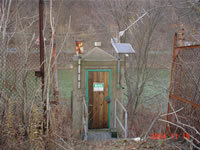 LOCATION.--Lat 40`36'16", long 79`33'08", Westmoreland County, Hydrologic Unit 05010008, on left bank 0.5 mi upstream from bridge on State Highway Alternate 66 at Vandergrift, and 2.2 mi upstream from Pine Run. PERIOD OF RECORD.--August 1937 to current year. Monthly discharge only for some periods, published in WSP 1305. October 1920 to September 1932 (gage heights and discharge measurements only) in reports of Pennsylvania Department of Forests and Waters. GAGE.--Water-stage recorder and Pluvio precipitation gage. Datum of gage is 769.40 ft above National Geodetic Vertical Datum of 1929 (U.S. Army Corps of Engineers bench mark). Oct. 1, 1920 to Sept. 30, 1930, non-recording gage, Oct. 1, 1930 to Sept. 30, 1932, water-stage recorder, at site 0.6 mi downstream at different datum. Satellite telemetry at station. COOPERATION.--Station established and maintained by the U.S. Geological Survey. Funding for the operation of this station is provided by the Pennsylvania Department of Environmental Protection, the U.S. Army Corps of Engineers, Pittsburgh District and the U.S. Geological Survey. REMARKS.--Flow regulated since 1971 by Yellow Creek Lake (station 03042260), since 1952 by Conemaugh River Lake, 23 mi upstream, since 1942 by Loyalhanna Lake, 20 mi upstream, and by other reservoirs above station; the 11 most effective of which have a combined capacity of 105,700 acre-ft. Supplied by NWS: Action stage-19.3 ft; Flood stage-25 ft; Moderate flood stage-27 ft; Major flood stage-28 ft.